Do You Want to Live Healthier and Be More Energetic? ProDermix - The Most Effective Probiotic is Just for You! ProDermix® has impressed many customers by relieving their outer skin fungus. It has eliminated cradle cap, diaper rash, eczema and eased constipation in infants. It has also greatly improved and/or eliminated athletes foot fungus and yeast infections (candida) in adults. While most brands state on there bottles ”potency guaranteed at time of manufacture” ProDermix® is guaranteed to retain its potency until the expiration date printed on the bottle. An eight month test showed that some other leading brands lost up to 90% of their original potency ProDermix® formulas retained the FULL original strength. If you want to learn more about probiotics and our breakthrough probiotic blend, ProDermix, you’re in the right place! 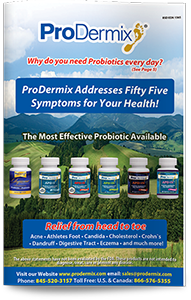 Here you’ll find everything from information on probiotics to probiotic benefits and the capabilities of ProDermix. Why is ProDermix Best for You? “Biotic” means life. It usually refers to the life of bacteria, the viral or fungal bacteria that creates sicknesses and maladies. To battle and neutralize those fungal bacteria, the medical and pharmaceutical establishments have researched and developed many different types of antibiotics. Nobody wants these bacteria to remain alive. The antibiotics destroy their life. Probiotics are not enzymes, vitamins or minerals, nor are they chemical compounds. Natural probiotics are microorganisms that are live in our intestines. Manufactured probiotics are “controlled bacteria” (i.e. friendly flora, healthy and beneficial bacteria) that are manufactured in controlled laboratory environments. The healthy flora or bacteria called “probiotics” are grown, fermented and cultivated from various media such as: dairy, vegetables, beans or beets and others. Probiotics work together with and complement the vitamins minerals and nutrients the human body needs for its vital functions. They battle the fungus, parasites and pathogenic bacteria that cling to the epithelial cells of your intestinal wall, which allows you to better absorb vital vitamins and minerals into your body’s organs. They support your immune system, acting as a security force by destroying foreign pathogens entering the system, as well as provide supply energy to your digestive tract. Food components that are difficult to digest and metabolize are absorbed with probiotics, which breaks down the chemistry of the nutrients and aids in their absorption into the vital organs. Want to learn more? Contact us today or start your 33% OFF Introductory trial here! Probiotics are the long-awaited solution to today’s super-unhealthy environment, where fast food outlets churn out daily menus laden with hydrogenated fats, heavy starches and carbohydrates. Probiotics are here to aid your digestive health and wellness, and help you maintain a healthy bacterial balance in the gastrointestinal tract. Probiotics help you grow and multiply the good bacteria in your gut — and that’s why so many people take it every day. More than 100 trillion species of bacteria inhabit your gastrointestinal tract. The healthy bacteria continuously battle the harmful bacteria, meaning that your digestive tract requires healthy flora to counterbalance the fungal properties propagated by the unfriendly flora. That’s where probiotics and ProDermix come into play! Science has proven that probiotics aid in the healthy digestion and absorption of necessary nutrients, vitamins, minerals and digestive enzymes in the gastrointestinal tract and beyond. The medical profession today already recognizes the significance of probiotics in its assistance in digestion and absorption of vitamins and minerals in the GI tract, and its abilities to enhance the immune system. Learn more by contacting us today or start your 33% OFF Introductory trial here! A substance that protects key cell components by neutralizing the damaging effects of “free radicals,” natural by-products of cell metabolism that form when oxygen is metabolized, or “burned” by the body. A process of adding alkaline substances to materials to counteract their acidity and neutralize the pH. The most common buffers used are magnesium, potassium, and calcium carbonates. A microbial colony-forming unit that is enumerated by direct count of viable, isolated bacterial colonies capable of growth on solid culture media. Yeast overgrowth in the intestinal tract that may cause vaginal infection. A substance that is directly involved in causing cancer. A bacterial infection affecting the deep layers of the outer skin. (bacteria enters lacerated or cracked skin). Cellulitis can attack any area of the body. It mostly appears on the legs. (Current Good Manufacturing Practices) Manufacturing guidelines recommended by US Food and Drug Administration (FDA) to provide the best quality assurance for pharmaceutical and nutraceutical products. [klo-STRID -ee-um dif-uh-SEEL] A bacterium that causes diarrhea and more serious intestinal conditions such as Crohn’s disease and IBS. It is a gram-positive, anaerobic, spore-forming bacillus that is responsible for the development of colitis. The messengers of the immune system. Cytokines are substances, either proteins or glycoproteins, secreted by immune cells. In cancer therapy, cytokines are used to enhance immunity. Cytokines regulate the innate immune system: natural killer (NK) cells, macrophages, and neutrophil. They also regulate the adaptive immune system. A biological environment of all organisms in a specific area of the body. These bacteria are medically known as Enterotoxigenic Escherichia coli. E. coli food poisoning is a foodborne illness that is caused by the ingestion of E. coli bacteria. Symptoms of E. coli poisoning include bloody diarrhea. Enterotoxigenic Escherichia coli or ETEC commonly referred to as E. Coli), is an important cause of bacterial diarrhea illness. Infection with ETEC is the leading cause of travelers’ disease. Enterotoxigenic Escherichia coli and Shigella (ETEC) are two of the leading bacterial causes of diarrhea worldwide, together killing more than one million people worldwide every year. Cells from the skin that protects underlying tissue from mechanical injury, hence, epithelial tissue. Epithelial cells help to protect or enclose organs; some produce mucus or other secretions. An inactive substance added to ingredients of medications or probiotics to enhance their absorbability into the various organs of the body. A probiotic compound used in fermentation of yogurt etc. (Generally Recognized As Safe) a term used by the Food and Drug Administration regarding food supplements on the market with a good and safe record. (H. pylori) – The bacteria responsible for most ulcers and many cases of stomach inflammation (chronic gastritis). The bacteria can weaken the protective coating of the stomach. It may bring on colitis or other digestive maladies. Products formulated to contain the fewest possible allergens so that they are not likely to cause an allergic reaction. A condition of low hydrochloric acid levels in the stomach that is often the cause of digestive disorders. A type of dietary fiber extracted from chicory roots that supports the growth of healthy bacteria (prebiotics). The major sugar found in milk. There are two basic types of leukocytes: phagocytes and lymphocytes. Cells that allow the body to remember and recognize their adversarial bacteria. The small organelles within a cell that control production of energy from food through ATP (adenosine triphosphate). A type of white blood cell or leukocyte which forms an early line of defense against bacterial infections. An enzyme that catalyzes the splitting of proteins into smaller peptide fractions and amino acids by a process known as proteolysis. Also called protease. Cells that chew up invading organisms. A swelling of a vein caused by a blood clot, usually in the legs. Sometimes life threatening. (FOS) fruchtooligosaccharides acts as food for healthy flora in the digestive tract. Certain probiotic strains multiply up to 1000 times with added prebiotics. An infection that affects mostly children and is one of the most common causes of diarrhea. It is a viral infection of the digestive tract. It is the most common cause of severe diarrhea in infants and young children in the United States. Media source on which the probiotic culture was fermented..
T lymphocytes – white blood cells that help the body immune system recognize and memorize adverse bacteria and pathogens. A substance that does not occur naturally and is foreign to the body, such as pesticides and industrial chemicals. Competitive probiotics on the market may lose 90% of their proclaimed effectiveness, within weeks after they’re sold. By contrast, ProDermix™ is a very strong probiotic that retains its potency right up to the date of expiration. It is guaranteed to be free of common allergens, preservatives and fillers including gluten and dairy proteins. Only the finest and purest ingredients are used to support the growth of the friendly bacteria in the gastro-intestinal tract.